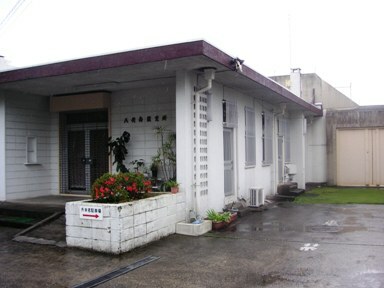 Our journey began, however, not in Vietnam, but in Japan. Having been a guest in our home in Philadelphia on many occasions, and having seen where I grew up in Perkasie, Pennsylvania, Ken wanted to share with us his own roots. 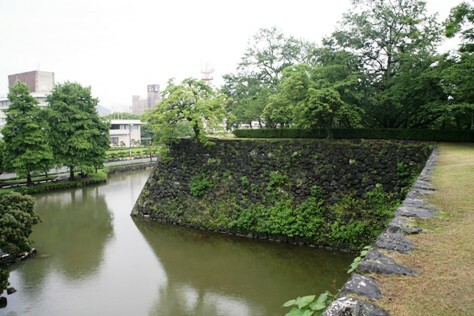 In Yatsushiro, Ken’s hometown, we stood on the walls of the ruined feudal castle where Ken had climbed and played as a child, watching a single black swan float slowly by below us. Built in the 1600s by the Lords of Yatsushiro, it had been destroyed after the war of the Last Samurai against the Meiji Restoration. 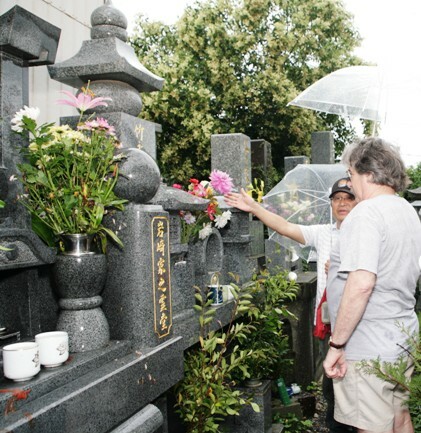 On its foundation, in 1874, a shrine was built to honor the then-crown prince of Japan. 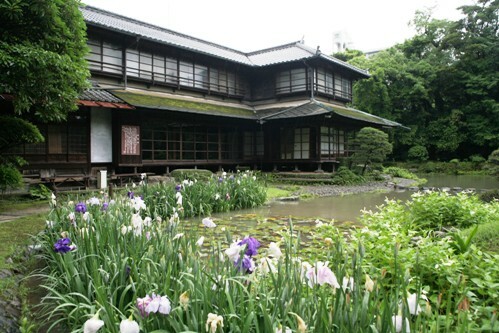 We also visited the nearby Shohinken or Pine Beach House, an elegant tea house built in 1688 by the third Lord of Yatsushiro for his mother, the pond behind it filled with lily pads and rimmed by irises. As we walked the streets of Ken’s old neighborhood, he pointed out the local jail where Ken’s grandfather had once been locked up for “overspending” on election day (long before Ken was born). The jailers, Ken says, were sorry to see his grandfather released because every day his wife would bring a sumptuous feast for her husband and for them. where Ken will also one day be buried. (SA) We stood on the corner where Ken’s house had once stood. 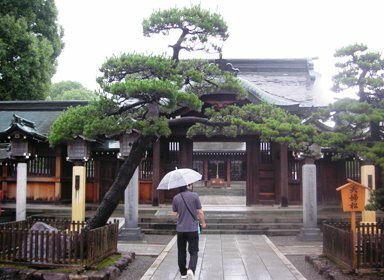 Though it has since been replaced by a newer structure, just across the street is Kangyo-ji, the Buddhist temple where his grandparents’ family grave is, and where his will be some day. 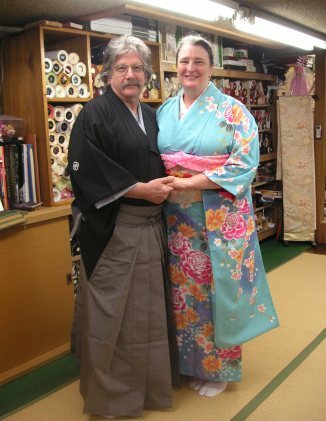 Later, Ken arranged for Anne and me to be decked out in traditional kimonos by a dressmaker and her two teenaged daughters (the process takes nearly an hour). 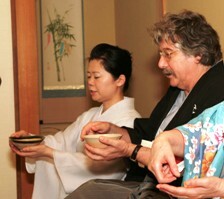 Having thus arrayed us, the three of them and an assistant then gave us a traditional tea ceremony.